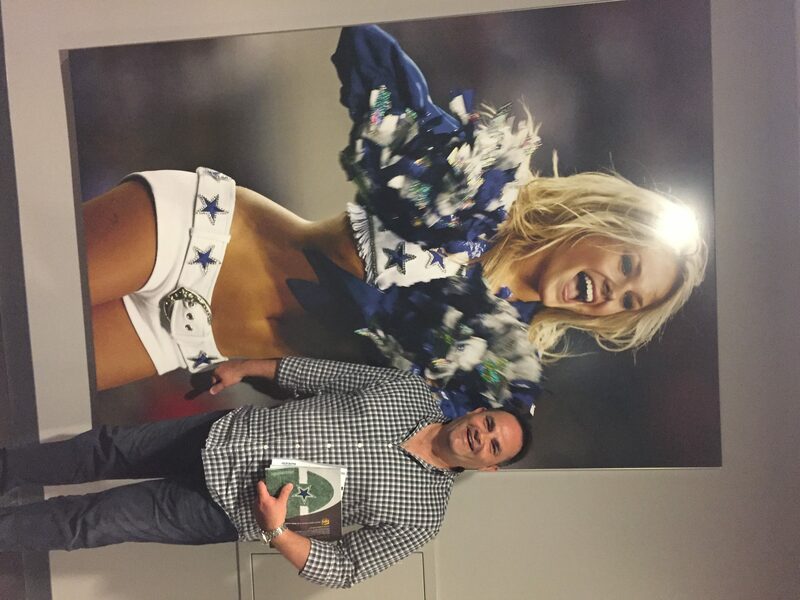 A month ago, I was fortunate enough to be invited to the USA and study the operation of the Dallas Cowboys. I have to admit I am not a huge NFL fan. Until 2014 when I made a similar trip to Denver and Dallas, I hadn’t watched a whole game of NFL before. Watching the NFL live is a spectacular experience. Probably helps being in the corporate suites with all that comes with that, but your average fan has a great time in these world class arenas. View from the suite with me on the right. Part of my job involves selling and deploying technology into stadiums and other popular public areas where people gather. I do a lot of work with worldwide technology leader Cisco. They hosted a couple of colleagues and I in the States to have a look at where the market is up to. You may have seen some of this work at places like the new members stand at the SCG, ANZ, Etihad or Adelaide, with Wifi and video screens. Similar technology is also being deployed in the new Perth stadium. The upgraded Parramatta and ANZ will be significant for consumers of fan engagement technology. However, it is fair to say the Australian venues are just starting to realise what this technology can do, both for revenue and fan experience. The USA are 3-5 years ahead of us and I went over to see what they are doing and how they are doing it. Parramatta Leagues and NRL Clubs have a huge opportunity to build a fully integrated IT, member and fan centric experience across the renovated club, the new stadium and the space in between. The club is aware of the possibilities, and they are looking at getting some smart people to help design what should be Australia’s best fan experience. The technology isn’t everything, but what it will deliver in terms of a unique experience will get people off their lounges and to the game. A winning footy team will help too! The purpose of this blog is to relay some of the observations I made on the tour, and how they could potentially apply to the Eels. I will try to make sure this doesn’t turn into a brag blog, but it will be hard, so apologies if you get sick of me quickly. 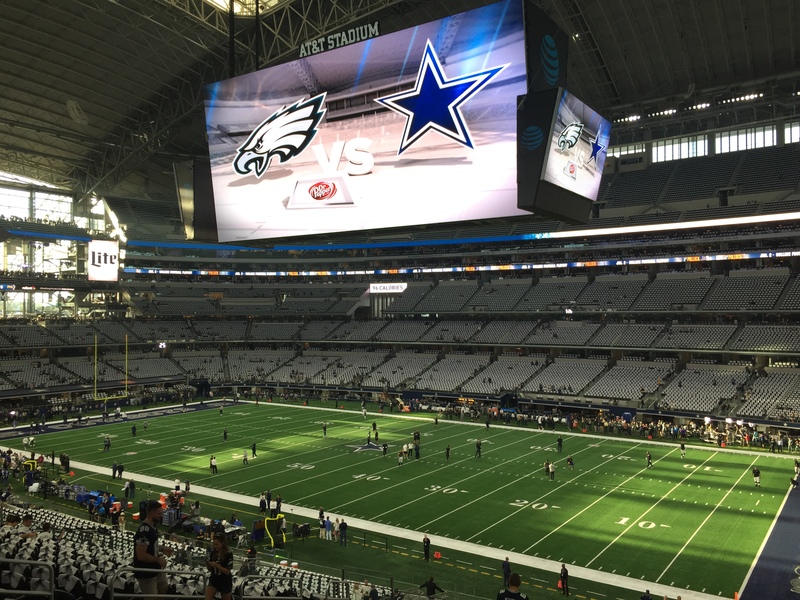 Day 1 – Cowboys vs Eagles at the amazing AT&T stadium. 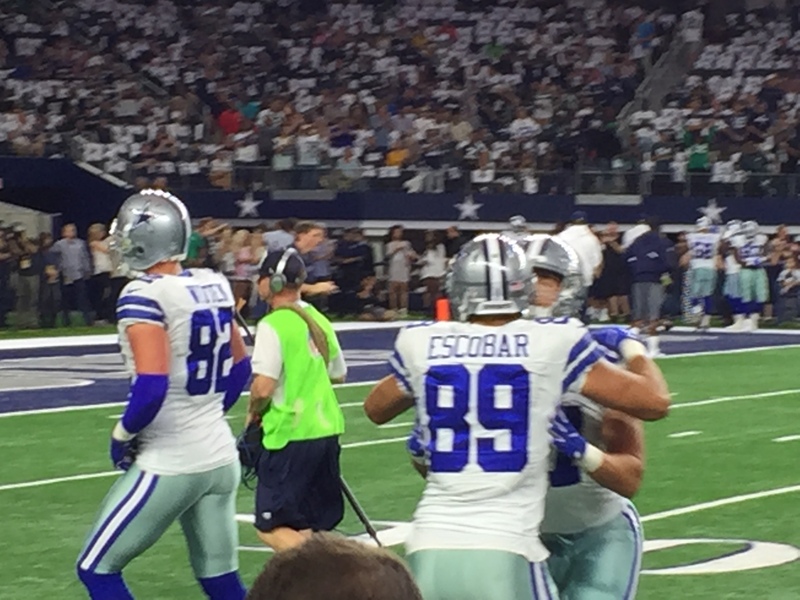 It was almost fate when the Cowboys won in overtime with a touchdown by their club legend and future Hall of Famer, Jason Witten (82). When I was there in 2014, the Cowboys lost to the Red Skins in overtime. They have improved significantly in that time. 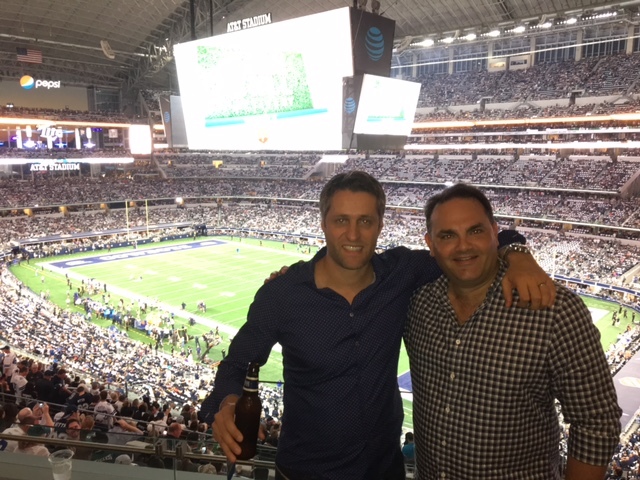 Day 2 – I was hosted by the Cowboys Vice President, Corporate Partnerships Sales and Services, and the Manager of Corporate Partnership Services at The Star, the Cowboys centre of excellence although it is much more than that. 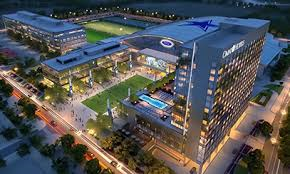 You can check is out here http://www.thestarinfrisco.com/. The Cowboys play out of AT&T Stadium which opened in 2009. It is an 85,000 seat indoor behemoth, the likes of which doesn’t exist anywhere in the world. They also cram in 20,000 standing spots for the super keen fan who misses a seat. A standing ticket basically means you watch the game from one of the open ends, or inside the ground in front of a TV near a bar. It is an amazing facility, catering for 8 Cowboys home games per season plus 2 pre- season games and any playoffs that they may make. The Cowboys haven’t had the best of times lately but revenue is up, and up in a big way. Owner Jerry Jones (more on him soon) was the driving force behind the vision and influence to design and construct AT&T Stadium in Arlington Texas, about 30 minutes from the Dallas CBD. The venue has received many awards for its design, and is recognized internationally as possibly the most spectacular and state-of-the-art sports stadium in the world. In its seven years of operation, 9 million fans have attended an event, and 3 million fans have toured the facility. The stadium now attracts many national and international events, all going to pay Jerry’s bills. AT&T has two 40 metre screens which hang from the roof. At either end, you have a normal sized Aussie stadium screen, but being so close, that too looks amazing. In fact, you find yourself watching the screen more often than the game! The experience is that good. 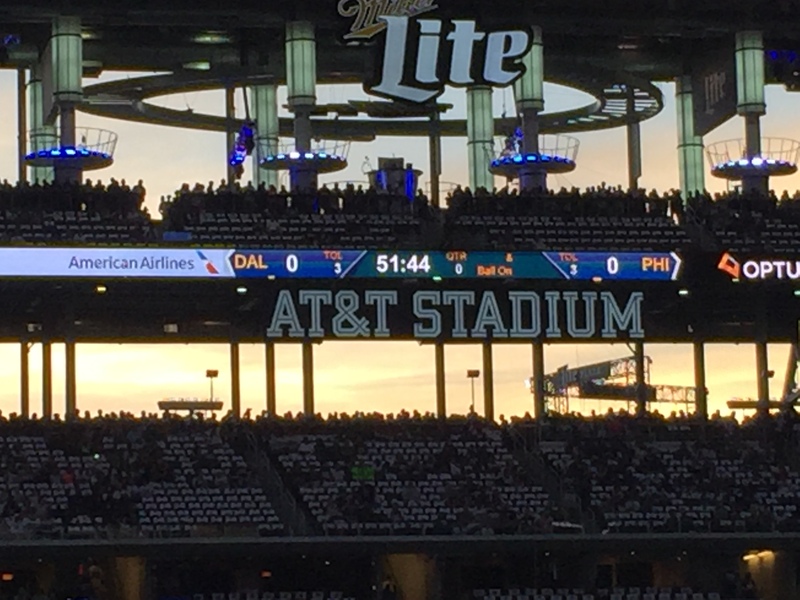 You can see the stadium here http://attstadium.com/. Worth a look. Obviously our stadium will be much smaller but some things for the builders to consider based on what I have seen on this trip and others. Steep incline similar to Suncorp gives the best experience of being close to the action. 4K video screens are everywhere (almost 3000) showing highlights, menus, specials, merchandise, sponsors and statistics on the game. Ingress and egress to bathroom facilities is fantastic with traffic always moving in one direction. There seems to be a theory of smaller shops and bathrooms but many more of them to spread the crowd out around the entire ground. Excellent food choice including a plastic cheese like substance poured over corn chips in huge volumes to gourmet samplings from local celebrity chefs. The concourse is open so while you are walking around you can see the game. This is one of my issues with Australian grounds. As soon as you leave your seat, you miss the action. Here, you can walk to the toilet or food outlet and see the game because the walkways are open to the ground. You walk in at the middle level of the stadium (3 of 7) so half the people go up and half go down, taking pressure off escalators and lifts. After all, Americans don’t walk up the stairs. Stadium apps allow you to order and collect food and beverage from another part of the shop so you don’t line up. Soon, the app will alert you to toilet queues, in fact, any queue in the whole stadium for anything. No paper tickets, everything is on your mobile. Also looking to limit cash transactions to speed us services. Perhaps the most significant opportunity for the Parramatta group will turn out to be revenue growth from a greater number and more significant events at the new stadium. The club should be able to work with Government and promoters to bring events to Parramatta and therefore, people through the door of the new leagues club. If we only see the Eels and Wanderers, we will have missed out on something substantial. The Cowboys are the NFL’s most valuable team for the tenth straight year and the world’s most valuable franchise as of last year at $4.2B. It is the first time since 2010 that a soccer team didn’t top the list (Man U and then Real Madrid). Credit NFL-record revenue of $700 million, $177 million more than any other football team. Owner Jerry Jones is the NFL’ ultimate power broker, pulling the strings behind the NFL’s Los Angeles relocation that eventually placed the Rams in the second biggest U.S. market. You may wonder why Jerry was so integral in setting up a competitor in LA – a rising tide lifts all boats. With a team in the LA market, revenues increase for all teams. As co-captain of the 1964 national championship Arkansas Razorbacks, Jones is one of a very small number of NFL owners who saw success as a football player. He is the only man in the history of the NFL to play for a collegiate national football winner and own a Super Bowl winner. Since the 1997 season, Jones has dedicated the half time show at the annual Thanksgiving game to launch the Salvation Army’s annual red kettle drive. Through the donation of national television airtime on the highest rating game of the season, the event has helped the Salvation Army to raise an additional $2B. As we all know, the USA is full of contradictions and NFL is another one. All revenues at an NFL level are split evenly in a very socialist way. TV, merchandise (except the Cowboys) and digital rights are all distributed evenly amongst all 32 teams. Several years ago, the Cowboys bought out of the merchandise licensing agreement with the NFL. They now pay the NFL a $100m per year licensing fee in order to control their own merchandise destiny, and keep all of the profits. They also manufacture the merchandise for other sports, car racing, baseball, and college football from the enormous factory in you guessed it, Mexico. 5 super bowl victories, including a Parramatta Eels like period with 3 out of 4 in the early 90’s when most of the fan base was built. Sound familiar? With an annual budget approaching $1B, a salary cap of $190m, you could say they are bigger than all four Australian football codes combined. Ok so you get the drift. They are massive in every sense of the word. A who’s who sponsors the Cowboys. AT&T, Nike, Pepsi, Miller, Dr Pepper, American Airlines, Ford and Panasonic headline the corporate partners. People get to the game early in the states. There is so much on, both in and outside the ground to keep you amused. I had heard all about the tailgating, but until you see it, you have no idea. People come from all over the state to sit in the car park and live up the atmosphere. There were some awesome setups, including this one. A trailer with a plasma, fridge, built in smoker and BBQ for those southern ribs. Not sure who the designated driver is though! We got the stadium at 5pm, just before the gates opened. After the typical metal detector wanding you get in the states, we were in, and on our way to the suite. After a few beers we went down to the ground to have a close look at the warm up. I think this is something Parramatta could improve on. Some of you may remember the Eels used to warm up on the oval behind the southern hill at Pirtek. I used to take my son out there and watch. You could get really close and see the team in action. It was a real ‘deep heat in the nostrils’ moment. No one ever bothered the players and most of them would say hello, particularly on the way there. It gave my son and I a real buzz to be so close, hearing them hit the pads, see the ball work, chase the ball from the Luke Burt goal attempts etc. I think the Eels could rope off area near the warm up at ANZ to get members closer to the action. Maybe 100 per game or something. 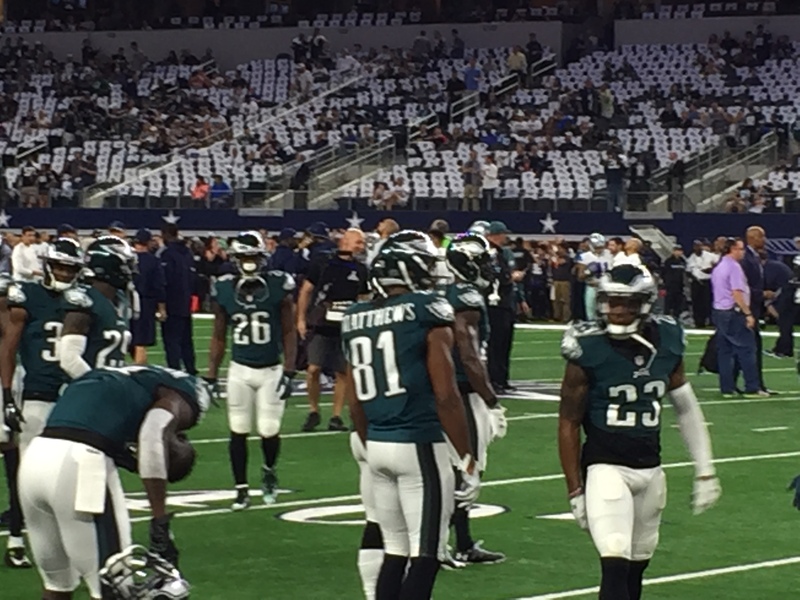 Here are some snaps and you can see I was standing right on the sideline. The Cowboys also do a number of activities for fans such as seat upgrades for those who went to extra effort to dress up, member guards of honour for the players, member interviews, lots of giveaways and member competitions where they can win prizes from sponsors on Cowboys trivia. Even though a 60 minute game goes for 3.5 hours, time flies and the atmosphere was great. Not as good as soccer games I have been to, or the Eels Dogs semi in 2009. In the USA it is more cheering than singing or chanting. 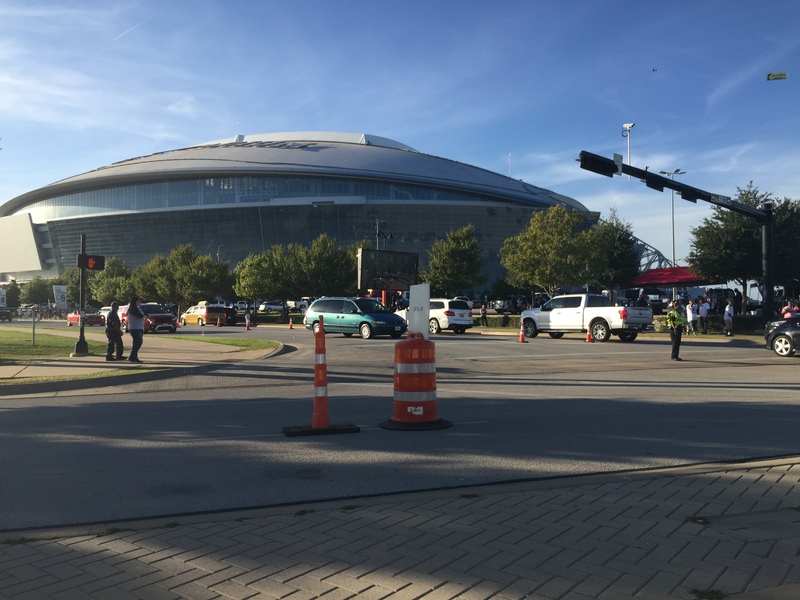 The Cowboys sell 90% of their stadium to season ticket holders. From goal line to goal line and for the first 51 rows, the tickets are the most expensive in the league, costing anywhere from $2,000 to $150,000 per seat. A recent study by the club suggests that average nett worth of fans who buy these tickets is $2m. It’s not a game for the working class. Expectations are high and so a huge focus goes to fan experiences. The other 10% of tickets go your general supporters and away fans. There is a significant secondary market for tickets. This is a place where as a ticket holder, you can resell your ticket at your asking price. The Cowboys partner with Ticketmaster to conduct the secondary market. The Eels will relaunch their seat warmer program in 2017, although your refund will go toward your next membership year fees. The next morning I was hosted by the Cowboys Vice President, Corporate Partnerships Sales and Services, and the Manager of Corporate Partnership Services at The Star. 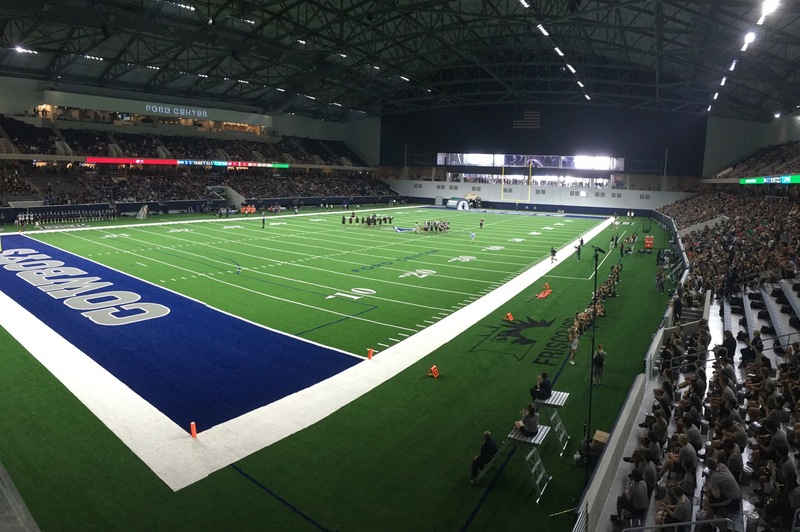 The Star is their new $1.5 billion team headquarters and practice facility in Frisco, about 30 miles north of Dallas which opened this year. The Star will eventually be a 91-acre retail and entertainment complex with a 16-story Omni hotel, convention space and medical centre. The site has a 12,000-seat indoor stadium to be shared with eight local high schools. The 12,000 seat indoor stadium where 8 high schools play. The team sold out 800 memberships to the Cowboys Club at The Star. 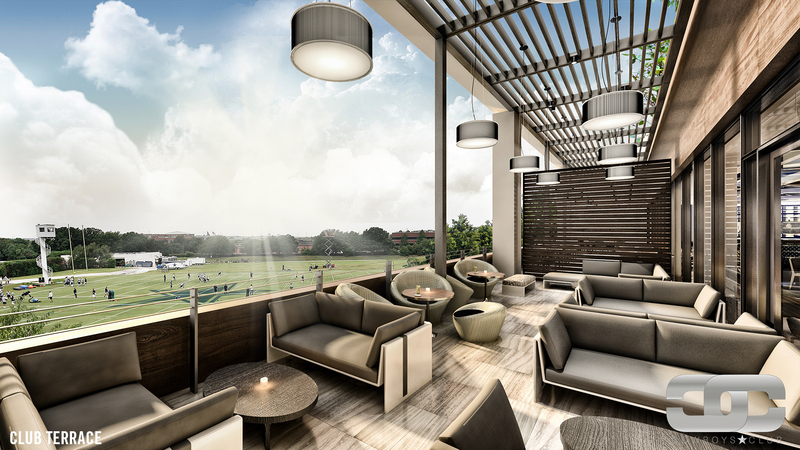 The $4,500 initiation fee plus $350 a month gives members a chance to watch practice for the Cowboys. Not quite sure if that would fit the budget for TCT to rock down to Old Saleyards and stand, leaning against the fence in the hot sun. The city of Frisco is contributing $261.6 million to the project with the Cowboys and investors covering the balance. The Cowboys Club where you can take clients to watch practice. This facility is a great example of the Jerry Jones philosophy- if you have a cost, turn it into revenue. He had to build a new facility, so he added, hotels, convention space, memberships, hospitals, gyms and commercial leasing. Jerry takes every day that he isn’t promoting his sponsors business at AT&T Stadium, to provide them an experience close to the team at The Star. It is a brilliant strategy. While other teams are practicing behind closed doors, general practice is done in front of paying people. They still take special practice behind closed doors, but 3 sessions per week are for paid viewing. The market research conducted by the Cowboys indicated people in their early 20’s are not quite as engaged in NFL as all other demographics. They have 185 million regular viewers, so they’re not about to go out of business, but they want to build those links. They do so by a very strong development program into high schools, building alliances and bringing small business in to sponsor teams. 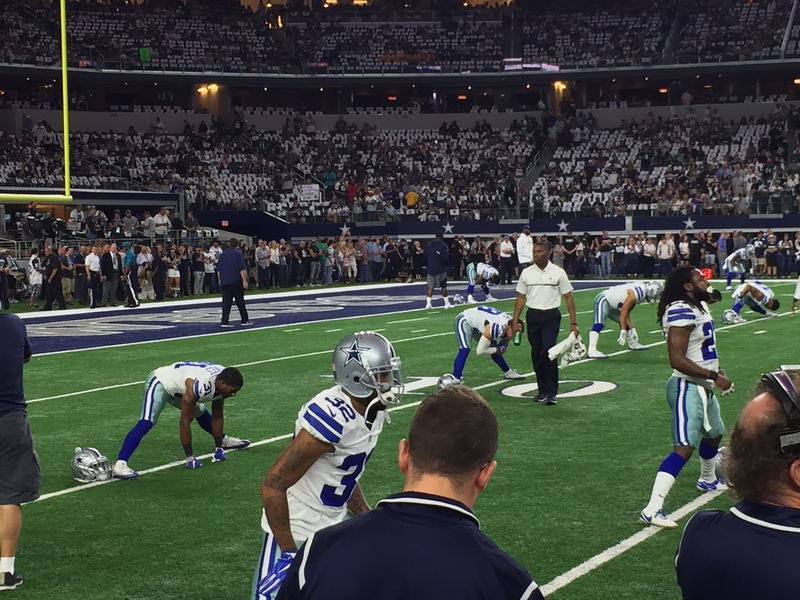 Their pockets aren’t deep enough to play with the Cowboys, but they can participate at The Star. 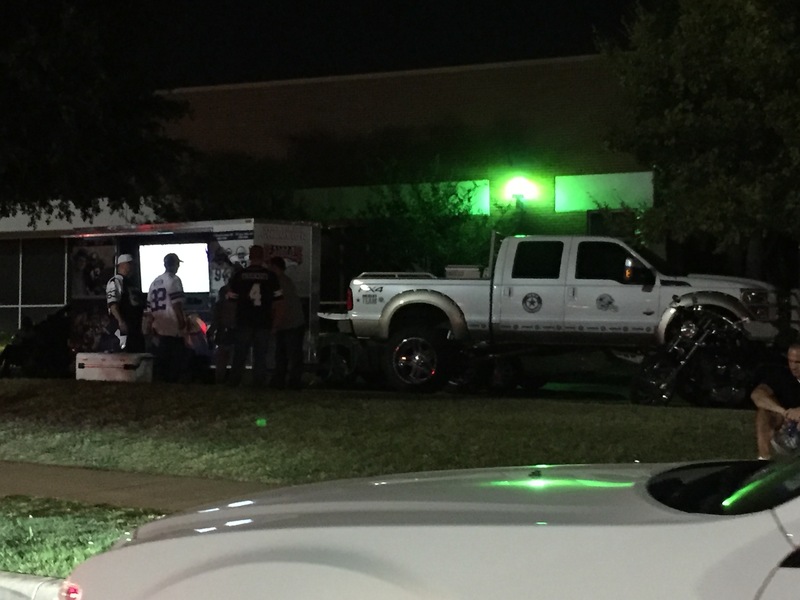 The Cowboys do an amazing amount of work with their fans and the community. It is a key platform of their success because many of these people can’t afford to attend games. Rookie Club – An annual outreach program designed to introduce the team’s newest members to the importance of giving back to the North Texas community. Community Quarterback Award – Since 2000, this award has recognized dozens of North Texas individuals for their above and beyond volunteering while providing more than $300,000 for the organisations they serve. Taste of the NFL – The Ultimate Cowboys Tailgate Party – In May each year the team host a tailgate party held on the field at AT&T. Silent and live auctions are held, together with live music and meals prepared by chefs from 24 of the area’s hottest restaurants. All proceeds go to Food Bank who have provided more than 5 million meals to children living in poverty since 2005. Dallas Cowboys Women’s Association – This is an organization of players, coaches and executives WAGS who work on behalf of the team to make a difference in the North Texas community. Since 2008, the group has raised over $600,000 for not for profit causes such as domestic violence, cancer research and sick children. Dallas Cowboys Legends – The Cowboys celebrate the team’s history by integrating the team’s former players into their year-round community outreach and game-day experience at AT&T. Now our club appears to be much less politically inclined, I think it is time to get some of our former players back into the fold. If you have stuck with me to the end, that’s a great effort and thank you. Even though these guys in Dallas operate in a different universe to the Eels, there is still plenty to learn and consider. While their budget is basically unlimited, they still have issues to address and demographics similar to Parramatta’s to ponder. The guys running the Cowboys organisation are some of the sharpest business people in the world and their success comes from their capability. This is something I am looking forward to with the Eels because in Max, Bernie and Bevan, I believe not only have we moved from the outhouse to the penthouse, but we have three of the best executives in Australian sport. 2017 and 2018 are risky years for Parramatta. Fan and member engagement is more important than ever to retain revenues and interest while we are at Homebush. Would love your ideas as to how we can ensure members stick solid through improved experiences. 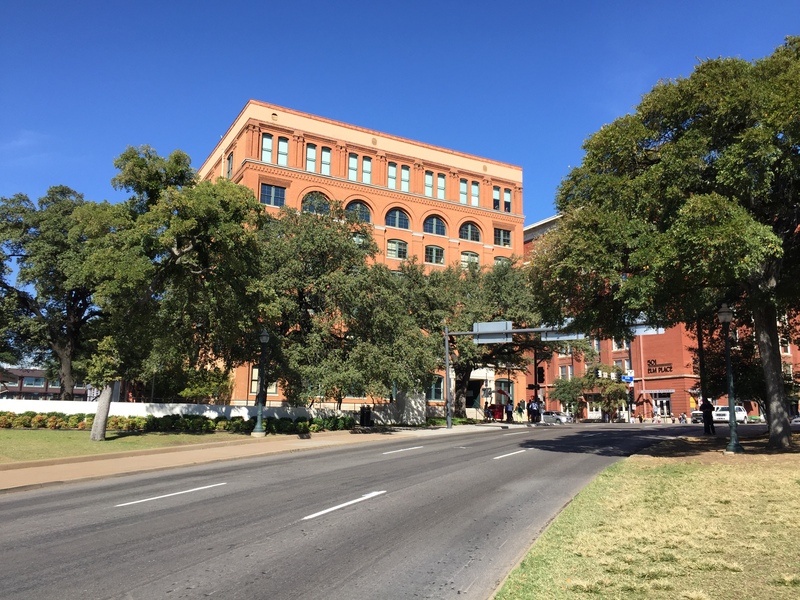 A few other snaps including one of the Book Depository in Dallas where they reckon some bloke shot a President. The grass knoll was an easier shot. I’m not a NFL fan at all, but your blog has put many ideas into things and also shared a snippet of what happens elsewhere. I’ve read the blog twice now, and am blown away at this. Do they only have 8 matches as its a shorter Comp..? And the screens everywhere. Again this is something is simple yet effective. Can you outline anything about the merchandise? Season tickets…? As in what do they receive for those expensive seats..? Really appreciate this blog Chris and it’s very interesting and great reading. It is interesting to see that they only have 16 rounds; and it runs for 5 months. It certainly looks to be an experience. I guess the enormity of what they do is amazing for us to see and hear. 30 year seats…that would be a family treat. I am glad you saved the best picture till last mate….that in itself is a highlight. I thought the Man U tour was good, but it is totally different when compared. Chris treated all of us to a bit of a prelim for this on Saturday. I must say that I enjoyed this post just as much as the stories on the weekend. Obviously economies of scale place some limitations on Parra’s fan ambitions, but member experience ideas can be gleaned from such an organisation as the Cowboys. The Broncos smashed the Chargers that day in 2014. Unbelievable. If you went to sporting Kc vs New York red bulls and got Tim Cahill in a selfie, in calling the cops. It was a Peyton masterclass, that’s for sure! Even from the bleachers that atmosphere was unbelievable. I could feel the stadium shake at every fourth down! We’re doing similar things in Qld Stadiums. network cabling for POS, TV, WAPs, BMS, CCTV, Ticketing and OB. Pretty much everything is on 1 Network now.